Sali con autista, limousine o limousine in un tour di una cantina da San Francisco con autista a Napa e Sonoma. Sorseggia la mimosa con la tua colazione a bordo mentre un autista professionista ti introduce nel paese vinicolo californiano. Scatta le foto del Golden Gate Bridge a Vista Point in rotta verso quattro grandi aziende vinicole come Jacuzzi Family Vineyards e Madonna Estate. Il tuo itinerario di un'intera giornata include degustazione di olio d'oliva presso la Olive Press, una sosta al CornerStone Sonoma e un pranzo al sacco. Con questo tour, vedere un giorno di vino in campagna con la limousine o l'autobus per feste. This wine tour is AWESOME!! We were able to stop at 4 wineries, the length and the first two stops could’ve been a little longer, they were under an hour. But each winery is very generous with the servings and tastings. Well worth it!! Party bus has a lot of space. Abe was an awesome and patient guide!! The wine tasting tour was very good. Our driver and guide Abe was super. Each winery we visited had their own unique quality and style. The scenery was breathtaking. We had a group on the bus that was a bit loud and rowdy but there really is not too much you can do about that. Abe did speak with them at one point which helped for alittle while. The tour was overbooked as the seating was extremely tight. We had a great time with Abe. This tour made our girls trip more amazing!!! The wineries were beautiful and the views breathtaking!!! We were picked up at Union Square on time by Abe our driver. He's an entertaining and fun driver who engaged the crew of fellow wine tasters mostly from out of town. One thing missing from the "party" bus was the music. Luckily a person from the group connected their bluetooth and started playing music. There was a stop at the Golden Gate Bridge for us to take pictures and play tourist. We stopped at four different wineries. Our favorite was the Jacuzzi Family winery, where Don gave us a lesson on wine tasting etiquette. We wondered over to taste the balsamic and olive oil offerings. After the trip we concluded that we should have visited 3 locations and spend more time at each location. The next places we visited were the Viansa, Madonna Estates, and Kieu Hoang. We had our picnic lunch at the Madonna Estates. Timing was great since we were quite hungry after two winery stops; although the sandwich wasn't the most amazing, it did hit the spot. We were dropped off back in SF. It was a great day trip out of town to take friends. This wine Tour was so much fun. The guide, Soccer, was amazing. This was part of a girls trip and we all had a blast. 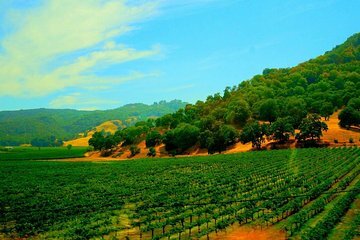 This tour shuttles you through staple sites in SF in a limo bus then to 4 wineries across Sonoma and Nappa. Besides the amazing wine, the best part of the tour is Abe, your driver, chef, and standup comedian. If you are interested in beautiful views, delicious wine, and a great time getting there, go with Abe. Excellent tour guide, he was so knowledgeable and so much fun. Got way more than we paid for, guide added extra wine stop to the tour. We had such a great time on this tour. From the beginning, Abe made us feel welcome. He's a very funny character. As you can imagine with a large group of strangers, there is some timidity at first. His jokes and great personality broke the ice. We stopped at 4 vineyards, each with its own charm. Jacuzzi was the first and my favorite. Be sure not to miss the Olive Press as well. We had a really fun group, which makes a huge difference. I would definitely recommend this trip to anyone who loves wine and a little adventure.